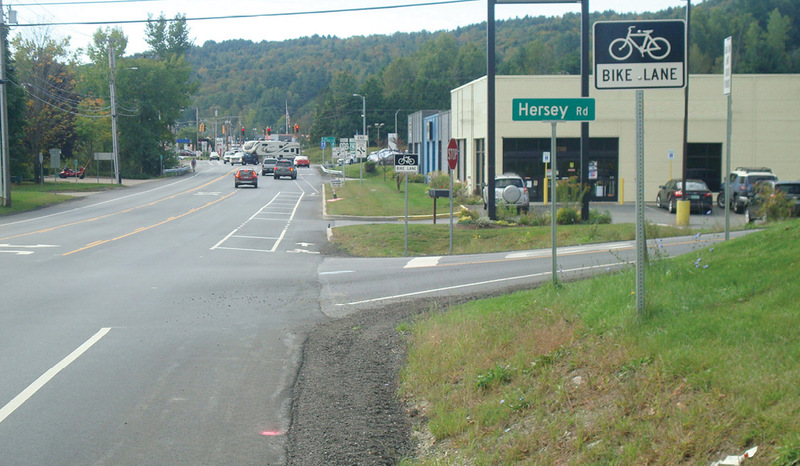 The Vermont Agency of Transportation (VTrans) was already exploring road diets and how they could be applied to improve safety for bicyclists and pedestrians. But it took the selection of road diets as an Every Day Counts (EDC) innovation for the idea to reach critical mass at VTrans. For several years, the Federal Highway Administration has encouraged adoption of road diets as a proven safety countermeasure. Also known as roadway reconfigurations, road diets reduce the number of through lanes on a road and reallocate sections of the paved surface for other functions—such as center two-way left-turn lanes, bicycle lanes, transit pull offs, parking, and pedestrian pathways. 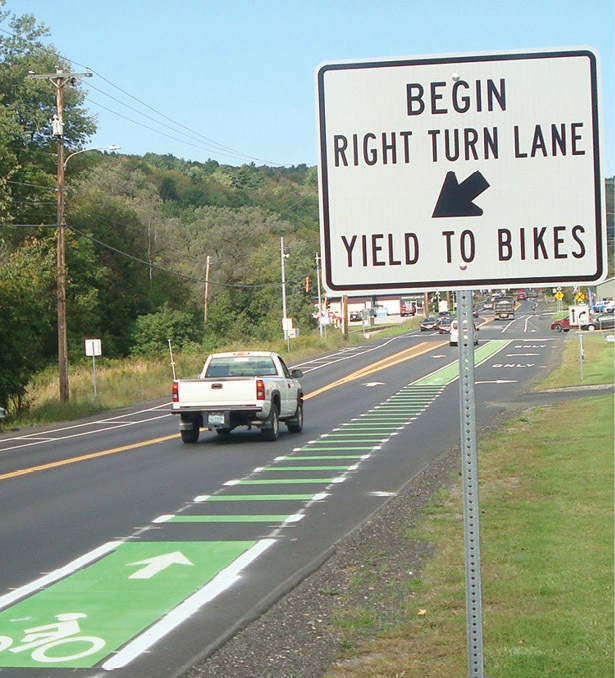 Green markings identify potential vehicle-bicycle conflict points and improve the visibility of the new dedicated bike lane on Barre-Montpelier Road. Credit: Vermont Agency of Transportation. While bicyclist and pedestrian user groups benefit from the safer travelways, road diets have another draw that propelled the solution onto FHWA’s list of proven safety countermeasures: research shows they reduce crashes by 19 to 47 percent. With support from FHWA, VTrans convened a road diet task force to initiate a work plan and develop criteria and a methodology to identify potential corridors for road diet installation. The task force selected the Barre-Montpelier Road project as the best candidate. “This was happening at the same time as a repaving project was being designed and on the heels of a municipal planning project to improve bicycle and pedestrian access in the corridor. With the agency decision makers thinking more about how we could use road diets, it all came together,” Kaplan said. The preconstruction roadway geometry included two travel lanes in each direction and a center two-way left-turn lane. The road diet configuration was striped in June 2016 with one lane in each direction, one center two-way left turn lane, and buffered bicycle lanes. With technical assistance from the EDC deployment team, VTrans developed a process for identifying potential corridors for road diets using objective, data-driven criteria; conducting early public outreach; and using long-term evaluation methods. A road diet project on Barre-Montpelier Road transformed a five-lane road to a three-lane road with bicycle lanes. Credit: Vermont Agency of Transportation. “We learned that outreach is a must for obtaining community buy-in,” Kaplan said. For the Barre-Montpelier road diet, outreach was front and center from the beginning and included an informational video, a news release, and interviews with local media to discuss the project and its anticipated safety benefits. The project’s public information officer even went door to door to talk about the project with residents and business owners on the corridor, and local government meetings became an important venue for gaining buy-in from elected leaders. “Local government leaders were inclined to support the project from the beginning,” Kaplan said. “In the end they got a big benefit at no cost,” he added, because the road diet was integrated into the already-planned repaving project. Since the road diet was installed, VTrans has observed more bicyclists and pedestrians using the roadway, Kaplan said. In the future, the agency plans to periodically install counters to measure bicycle traffic rates and review corridor safety data to evaluate the road diet’s impact. As a result of the Barre-Montpelier project, VTrans now has a list of criteria for identifying potential corridors for road diet projects. The agency plans to integrate those criteria into its asset management program and a road diet guide to help staff pinpoint candidate locations based on traffic and roadway characteristics, crash data, traffic speeds, level of bicycle priority, and land use patterns. VTrans will also define a process for installing and evaluating road diets. Contact Becky Crowe of the FHWA Office of Safety for information and technical assistance on road diets. An essential part of successfully deploying innovations is capturing the value of these investments. How to quantify, qualify, and tell the story of innovation was the topic of a session at the 2018 Transportation Research Board Annual Meeting in January. Innovations are used in transportation to save lives, money, and time; improve mobility; and use resources more responsibly. “Assessment of value is made by the user or consumer, not by the creator,” said CAI Director Thomas Harman. Another key aspect of assessing innovation is level of impact. Harman and Dr. Audrey Copeland, National Asphalt Pavement Association vice president, told the story of the agency push and industry pull for adoption of warm-mix asphalt (WMA), promoted by Every Day Counts in 2011 and 2012. WMA technologies improve asphalt pavement compaction at lower production temperatures, which can increase performance, reduce fuel use and emissions, and improve worker comfort. The potential benefits encouraged industry to pull for WMA adoption. “Industry saw several benefits, including competitive advantage, energy savings, and possible cost savings with improved construction,” Copeland said. Potential risks included the need for capital investment in production plants, damage reputation if there was an early failure, and limited market if the perceived ROI was overstated, she noted, but for industry the innovation’s potential outweighed the risks. At the same time, agencies pushed to add WMA to their paving toolkits. “The benefit of improved performance was key,” Harman said. “In addition, agencies were looking at the potential to extend the paving season.” As with industry, he said, agencies saw potential risks, such as the politics of failure. “It is important to understand the difference between output and outcome during the deployment of new technologies,” said Harman. At first, the number of agencies with WMA specifications and contractual language was used to gauge implementation. Later, performance measures obtained through studies tracked production levels and assessed performance. Today, nearly a third of all asphalt pavement mixtures are produced using WMA technologies. The Wisconsin Department of Transportation (WisDOT) follows five steps to implement innovations: incubate, demonstrate, pilot, communicate, and implement. WisDOT uses the ROI concept in different ways at each step to communicate the potential benefits of an innovation. During incubation, agencies should determine whether an innovation shows financial benefits or opens doors to other opportunities. In the demonstration phase, it is important to find out if anyone else has documented success or ROI. If not, is there a quick and easy way to test and prove the concept? Pilot projects help agencies put ideas to the test and provide an opportunity to document benefits to get to the core value. The next step is to communicate the pilot results, including the pros and cons, lessons learned, potential benefits, and ROI. The final step is to implement the innovation. ROI might change depending on the scope and scale of the implementation, so Esse suggested that agencies use ongoing ROI analysis to track and communicate success. FHWA developed the benefit-cost analysis template for calculating e-Construction ROI as part of a research project assessing how transportation agencies use paperless processes in project delivery. Agencies can use the tool to evaluate the business case to invest in e-Construction initiatives or to quantify the benefits of e-Construction practices they have already implemented. Agency leadership must support calculated risk taking. The agency must devote resources, such as people and money, to innovation. Innovation must be a priority culturally. Employees must believe innovation can happen. Everyone must understand that change takes effort. The agency needs innovation champions. “Addressing Challenges and Return on Investment (ROI) for Paperless Project Delivery (e-Construction)” (FHWA HIF-17-028) reports on research conducted to prepare a practical guide to help transportation agencies assess the feasibility of e-Construction improvement opportunities, prioritize these opportunities, and plan for implementation. Esse believes the chances for success are higher when innovations are driven by business needs and goals: “What are our priorities internally? Can we identify innovations that support our priorities? These are often the low-hanging fruit.” Many innovations are multiyear initiatives, so it is important to show incremental benefits and share the benefits with management so they will keep making those investments, he said. Innovation builds on innovation, expanding the power of new ideas. “Lots of small lightbulbs can light up a room, so treat those small ideas with respect because you never know what kind of door some of those smaller ideas will open,” said Esse. Automated traffic signal performance measures enable agencies to collect data continuously and respond to issues faster. One quarter of the Nation’s traffic fatalities and half of all injuries are attributed to issues occurring at intersections. Signal retiming can improve traffic safety and operations, but highway agencies typically retime traffic signals on a 3- to 5-year cycle. For most of the country’s 330,000 signals, citizen complaints are the primary measure of performance. Now, there’s a better way to manage traffic signals. The Federal Highway Administration is promoting automated traffic signal performance measures (ATSPMs) in Every Day Counts round four (EDC-4) as a way to improve on traditional signal management. Agencies use sophisticated data from ATSPMs to manually retime signal lights. Using ATSPMs to enhance safety and customer service is generating interest across the country. Twenty States are developing implementation plans and learning more about this innovation. Sixteen States are demonstrating and assessing the technology. Georgia and Utah have made ATSPMs a standard practice. In 2015, the city of Overland Park, KS, began using ATSPMs developed by UDOT after learning of the system in a webinar. “At that time, UDOT staff were gracious enough to install the system and get it up and running on a city server,” said Shawn Gotfredson, supervisory civil engineer for the city. Since then, the city has added all 181 traffic signals capable of collecting data to the system and plans to upgrade the remaining 85 signals to ATSPM-compatible controllers. ATSPM tools enabled the Georgia Department of Transportation (GDOT) to efficiently redirect vehicles and adjust signal timing after a fire and bridge collapse on I-85 in Atlanta last year. GDOT maintains 3,500 of the State’s 9,500 traffic signals. Of the GDOT-maintained signals, 3,109 are ATSPM-capable. 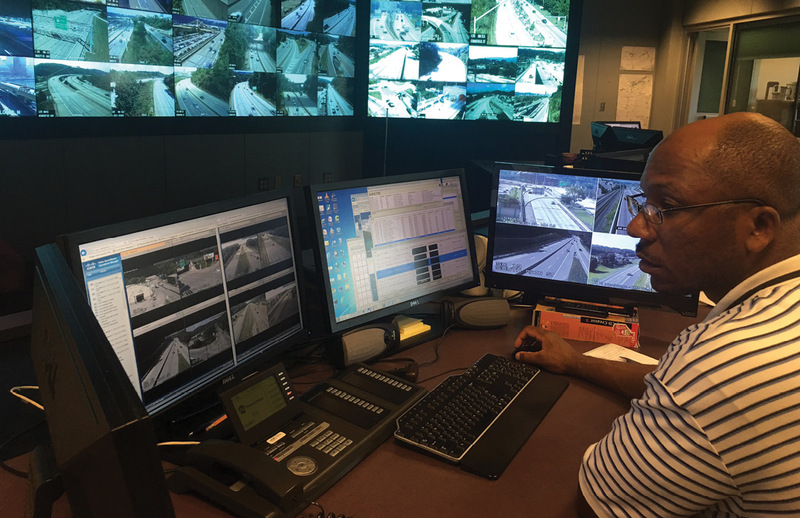 With more than 88 percent of its signals reporting high-quality data, GDOT uses ATSPMs as its primary tool to improve operations and manage maintenance of its traffic signal network. View an EDC-4 Innovation Spotlight video on ATSPMs. View “Are Your Traffic Signals Ready for Automated Traffic Signal Performance Measures?” webinar. Download ATSPM software at FHWA’s Open Source Application Development portal. Contact Eddie Curtis or Rick Denney of the FHWA Resource Center for information and technical assistance, including training and workshops. Replacing an intersection with a roundabout reduces traffic crashes, but it can take 2 years or more to design and build a roundabout project. When crashes at a congested northern Virginia intersection rose to nine per year, with nearly half involving injury, the Virginia Department of Transportation (VDOT) sought a faster solution. VDOT engineers evaluated several forms of traffic control for the two-way stop intersection in Loudoun County, including all-way stop signs and traffic signals, but they determined that the best remedy was a roundabout. There are more than 200 roundabouts throughout Virginia that enhance safety and reduce congestion at intersections. 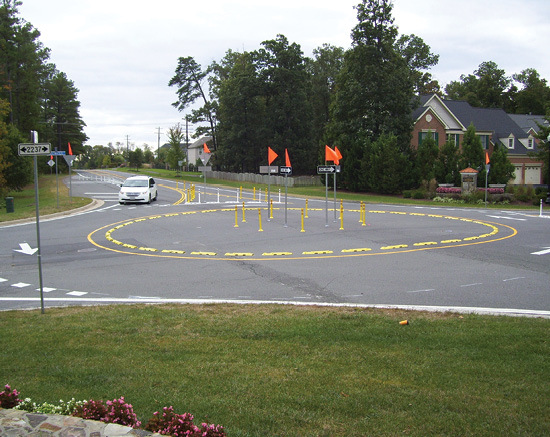 VDOT wanted to address the immediate safety problem while developing a roundabout project, so engineers came up with an “instant roundabout” using off-the-shelf markings, tubular markers, and plastic curb sections. Engineering, material, and labor costs totaled $90,000, 95 percent less than the cost of a permanent roundabout. Project design took about 6 months and installation took less than 6 days in 2013. The results were dramatic: Overall crashes decreased 30 percent and injury crashes dropped 89 percent, about what would be expected of a permanent roundabout. A 3-minute-long traffic queue during rush hours also disappeared. The project won a 2017 National Roadway Safety Award from the Roadway Safety Foundation and Federal Highway Administration. The project was not without challenges, though. “The hardest part was getting the community to accept the roundabout idea,” said VDOT District Traffic Engineer Ivan Horodyskyj. While engineers designed the project, the agency’s public liaison team reached out to the area’s county officials and homeowners associations to explain the benefits of roundabouts. Homeowners expressed concerns about the appearance of a roundabout made of plastic parts and its effect on property values. “We said this is temporary, we expect it will provide immediate relief on crashes, and we’ll revisit it after the construction is over,” said Horodyskyj. The homeowners associations eventually agreed to the project and, after residents saw crashes diminish, asked VDOT to make the roundabout permanent. Construction is underway on a permanent roundabout at the Loudoun County intersection. Meanwhile, VDOT plans to consider using instant roundabouts at other locations as an immediate fix to prevent crashes while permanent solutions are implemented. VDOT is also working with FHWA on a temporary modular mini-roundabout at a Fairfax County intersection. Mini-roundabouts offer the safety benefits of regular roundabouts in a smaller footprint, making them appropriate for areas with limited rights-of-way. The Fairfax County pilot is part of an FHWA research project to evaluate accelerated-deployment mini-roundabouts constructed of prefabricated panels made from recycled composite material. The Georgia Department of Transportation installed this modular mini-roundabout system near Atlanta in 2017 and is now evaluating its effectiveness. See FHWA’s Roundabouts Outreach and Education Toolbox for outreach success stories and implementation guidance. Read a case study on how VDOT used a variety of methods to conduct public outreach and generate support for roundabouts. Contact Jeff Shaw of the FHWA Office of Safety for roundabout information and resources and Hillary Isebrands of the FHWA Resource Center for technical assistance and training. Contact Wei Zhang of the FHWA Office of Safety Research and Development for information on the mini-roundabout pilot project. VDOT chose the Fairfax County intersection for the pilot because it meets the thresholds for a controlled intersection and a roundabout can be installed there without the need for new pavement, right-of-way approvals, utility relocation, or drainage work. VDOT expects the roundabout to take a few days to install in the spring. VDOT and FHWA will evaluate the roundabout for ease of implementation and impacts on maintenance, such as how well snowplows negotiate the structure. If the project is successful, the roundabout could remain as a permanent structure. The Michigan Department of Transportation (MDOT) developed a draft Geospatial Utility Infrastructure Data Exchange (GUIDE) Procedural Manual to detail processes for collecting and storing 3D geospatial data for underground utility installations in MDOT rights-of-way. State Transportation Innovation Council (STIC) Incentive funds were used in part for the manual’s development. MDOT is the first State transportation department to document a procedure for collecting location data for permitted underground utility installations. Having accurate utility location information will help MDOT reduce project conflicts, delays, service disruptions, and redesigns, as well as improve worker safety. With the help of STIC Incentive funds, the Ohio Department of Transportation (ODOT) held “Local Public Agency Days at the Grassroots Level” sessions in ODOT’s 12 districts. Conducting district-level sessions instead of regional meetings enabled ODOT to better respond to local agency needs in each district and encouraged collaborative discussions between ODOT and local agency staff on innovation implementation. Each session focused on local agency deployment of e-Construction, road diets, and data-driven safety analysis, as well as topics geared to that district. As a result of the STIC project, ODOT plans to continue regular district-level meetings for local agencies, supporting ODOT’s stakeholder partnering with local agencies on project and program delivery. 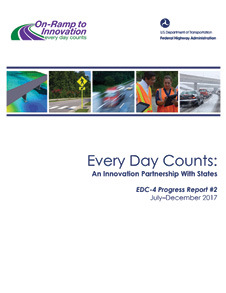 EDC-4 Progress Report #2 summarizes the status of innovation deployment for the 11 innovations in the fourth round of Every Day Counts as of December 2017, halfway through the 2-year cycle. Read deployment highlights for each innovation and view maps and charts to learn how innovation implementation is advancing in States across the country.